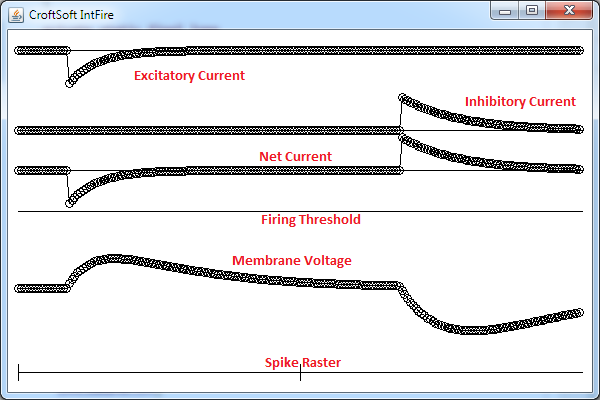 This is an animated simulation of the Leaky Integrate-and-Fire neuron model. Click your left mouse button on the applet above to inject excitatory current; click your right mouse button to inject inhibitory current. Press the spacebar to pause and resume the simulation. Press the 'F' key to toggle display of the frame rate. You may use this application under the terms of the Open Source GNU Lesser General Public License version 3.0 (LGPLv3). If it does not install, check that you have Java installed first, version 6 or above. The source code is available from the CroftSoft Code Library. Add the CroftSoft Update blog to your newsfeed reader for an announcement of the next release.